Marla Singer (Helena Bonham Carter) from Fight Club! Now onto this month where my header is honoured by the presence of a new and much loved guest! 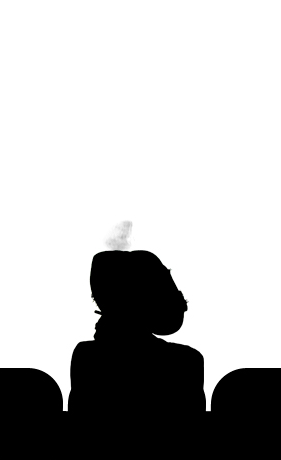 As always you need to be guessing the silhouettes on the far left of my header above (I’ve also stuck the image below), and once you think you know who they are all you have to do is head on over here to the ‘Who’s That?’ page and make your guesses. At the end of the month I’ll announce the answers, as well as listing and linking back to those of you who manage to guess correctly. Thanks for playing, and have fun! Remember, please don’t make your guess in the comment section as it spoils the fun for everybody! Tags: August, charcters, Fight Club, film, Helena Bonham Carter, Movie, Quiz, Silhouette, Who's That? My winning streak is back! 😀 😀 Ooooooh! Fun one! Thanks James! Thanks! Congrats, I hope you can guess this one! It’s so obvious now. Doh! Haha, it’s always easy once you know!